Choosing the best snowblower for your needs is somewhat dependent on the area you need to clear, but it’s also determined by the type of snow you typically remove. Both single-stage and two-stage machines are great for clearing snow from your driveway and sidewalk, but they remove snow differently, and each works best for different types of snowfalls. Single- and two-stage machines remove snow using different throwing actions. With a single-stage snowblower, a high-speed rotor gathers and throws the snow in one efficient motion. Toro’s Power Curve technology allows the rotor to help propel the unit forward, making it easier to use and more maneuverable. Single-stage snowblowers also clean down to the pavement, eliminating the need to go back and shovel or sweep to finish the job. Single-stage machines are great for most paved driveways and sidewalks. Because they clean down to the pavement, they should not be used on unpaved surfaces. They are best used to clear up to 9” of snow at a time. Single-stage machines are also great for wet, slushy snow because of the scooping action of their curved paddles. A two-stage snowblower is typically bigger and more powerful, making them a good choice for deep snow. If you live in an area that gets a ton of snow each year, a two-stage snowblower can be the way to go. Perfect for tackling “lake effect” snow, snowfalls of 12-inches or more, or big snow drifts, Toro two-stage machines first gather the snow in with a heavy-duty, serrated auger. Then a high-speed impeller takes over, launching the snow from the chute, throwing it out of your way. Two-stage snowblowers are perfect for large driveways, gravel surfaces, and hard compacted snow. 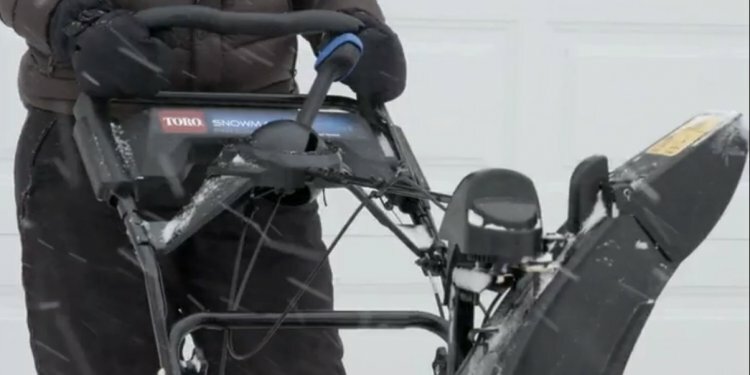 For small areas such as decks, steps, patios, and small sidewalks — where a larger snowblower won’t reach — you might consider an electric snowblower like Toro’s Power Shovel or 1800 Power Curve. Both are easy to use and virtually maintenance free. Just plug one in, and you’re ready to take on whatever Mother Nature dishes out. The Power Shovel is great for those lighter snowfalls when your snow removal service doesn’t cover the job. This powerful machine will tackle snow up to six inches deep on any hard surface.